It might be March, but the prospect of going outside is about as appealing as a snog with Cheddar Man. This month’s snowmaggeddon was like being in hell while Satan was having a refurb: “I’m done with fire now, lads – let’s see what suffering I can cause with artic temperatures and ice!” So as much I want to celebrate St. Patrick’s Day – especially as it’s on a Saturday this year – I’ll be doing it in the warmth of my own home. I’m stocked up with more booze than a Dublin brewery and I’m inviting the girls round to get raucous. I’ve planned my own St. Patrick’s Day Bingo Party, with miniature Irish flags as markers, and a cocktail menu that predominantly comprises combos of Baileys and Jameson’s. In tribute to Father Jack, we shall be bellowing: “Drink! Girls! Bingo!” instead of plain old “Bingo” and I have brainstormed a bespoke list of Irish bingo calls. Then there’s the dress code for looking on fleek… If I haven’t invited you here’s the blueprint for my St. Patrick’s Day Bingo Party! I want everyone looking (sham)rock star ready when the scorecards come out, so arrive at least an hour before eyes-down for party prep over pre-drinks. Tonight’s photos should be Insta (pot of) gold, so nominate someone arty* to help everyone else with the fiddly bits. *If none of your friends are arty, at least invite someone with a steady hand, who won’t have seen St. Patrick’s Day as an excuse to start drinking before breakfast. 1. Wear one item of green, with another item or accessory in either white or orange. If anyone wears all three colours, they get to automatically mark off a bonus number of their choice on their first three scorecards. OPTION: If you don’t want to be seen in green, you can opt to wear green underwear. But be warned: you’ll need to flash it if anyone asks you to prove it! FORFEIT: If you’re not wearing at least two of the tricolours, and you can’t (or won’t) prove you’re wearing green underwear, you’ll automatically lose a number on your first three scorecards (ie when one of your numbers is called, you won’t be able to mark it off). 2. Paint your nails in vertical stripes of green, white, and orange, to represent the Irish flag. OPTION: If (like me) you are bad at painting your nails and have a complete lack of patience, you can do two green, one white, and two orange, from left to right, on each hand and foot. FORFEIT: Anyone without their fingernails painted in the Irish colours loses a number on their first three scorecards. 3. Paint the Irish flag - or a shamrock, a harp, or a Celtic cross – on your face using face paints. If you do, you can automatically mark off a number of your choice on your first three scorecards. OPTION: Paint your St. Patrick’s Day emblem on your arm, shoulder, back or wherever you like instead – but you must be willing to flash it if asked! FORFEIT: Anyone without a St. Patrick’s Day logo sacrifices a number on their first three scorecards. It’s St. Patrick’s Day, so whenever someone gets bingo, everyone has a shot. If you’re hosting, prepare trays of these shots before your friends arrive, so you don’t waste valuable bingo time in the kitchen. You’re going to need at least one bottle of whiskey (Jameson’s or Pogues), one bottle of Baileys, one bottle of Tia Maria, and one bottle of Midori (because, green). Keep these in the fridge. Irish Frog: This is one part Baileys to one part Midori. Pour the Midori into the shot glass first, then pour a layer of Baileys on top. To keep the spirits separate, so you’ve got two stripes, pour the Baileys in slowly, over the back of a teaspoon (or a bar spoon if you’ve got one) moving the spoon upwards as the glass fills. Fruity Irishman: For anyone who likes their Baileys more than Midori, make a Fruity Irishman which is two parts Baileys to one part Midori (made in the same way as an Irish Frog). Shamrocked: To make ten in one go, fill a cocktail shaker with ice, then pour in 20 ounces of Midori, five ounces of whiskey and five ounces of Baileys. Shake well, then strain into shot glasses. Baby Guiness: There’s no Guinness in it! Pour Tia Maria (or coffee Patron) two thirds of the way up a shot glass, then pour a layer of Baileys on top, using the back of a spoon – it will look like a mini pint of Guinness! Bonus shot: If you’re willing to put more work in than I am, these Guinness Jello Shots look amazing! So, at one end of the effort and authenticity scale there’s Irish stew, or corned beef and cabbage, and at the opposite end, there’s sticking some green M&Ms in a bowl. But I reckon that somewhere in the middle, there’s hot mashed potato made with buckets of butter, and fried bacon bits mixed in - which in this weather is exactly what I want. For easy eating, serve this up in bowls, with a spoon and it should soak up some of the alcohol. Have green M&Ms dotted about anyway, and if you do want to get creative in the kitchen, make some shamrock shaped cookies with these cookie cutters. Decorate the walls with Irish flag bunting, and cover your drinks table with this Irish flag table cloth. Buy a multipack of green, white and orange balloons, and tie them together in threes (like the three colours of the flag), with green curling ribbon. OK, so we’ve got the dress code, the drinks, the snacks, the décor and the soundtrack, now let’s get down to Bingo! 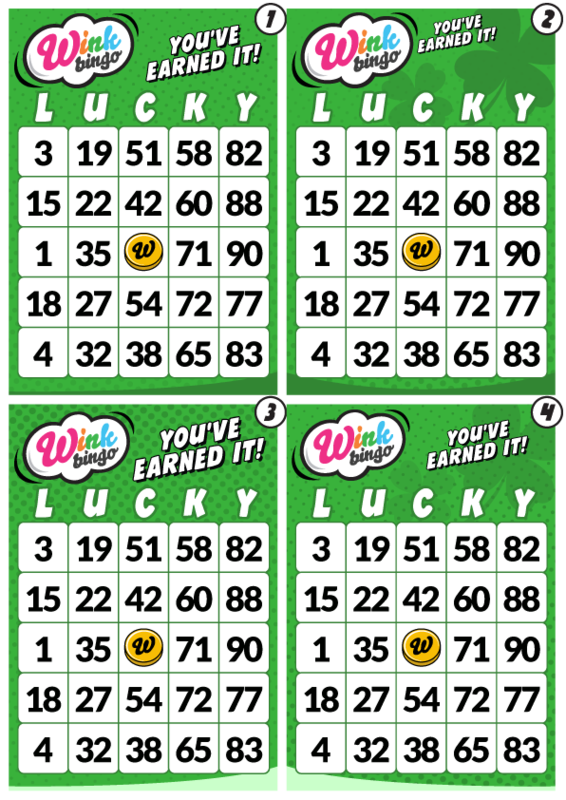 You can print off Wink's Irish bingo cards free. To play with these, you’ll need to write all the numbers (1-90) on bits of paper, and pull them out of a hat. If you’ve got the money, and you don’t want to faff about writing on bits of paper, you can buy an all-you-need bingo starter kit here. How to play Irish Bingo? The host will take the first turn at being the Bingo Caller. They’ll be calling out the numbers, so they can’t play that round, but they can wear a fetching leprechaun hat Everyone else should have a scorecard and markers. The Rules: The scorecard is made up of 25 squares, ie five rows of five squares, with “LUCKY” across the top. The caller will randomly pick out a number (from a hat, or a bingo spinner) and they’ll call it out. So, if they call “5” you look to see if you have a “5”. If you do, put a marker on it. Your aim is to cover five squares in row, whether it’s vertical, horizontal or diagonal. If you do, that’s Bingo! Note: There’ll usually be a blank square in the middle of the card – you can automatically cover this with a marker, without a number being called. The markers: It’s St. Patrick’s Day, so I’m using miniature Irish flags on cocktail sticks! If you can’t get hold of these, buy a box of Lucky Charms breakfast cereal and cut out the pictures of leprechauns and pots of gold. You might need a box each for this – or just use the actual Lucky Charms cereal itself. The Luck of the Irish: If you cover five squares in a row, immediately shout, “Drink! Girls! Bingo!” in the manner of Father Jack. In order to win, you need to shout it before anyone else – and also before the caller can announce the next number. The caller will then give everyone with a shot, and the winner will get the leprechaun hat, to take the next turn at being the Bingo Caller. Remember: You may have to forfeit numbers – or you may be able to mark off bonus numbers - depending on points accrued in the Dress Code section. 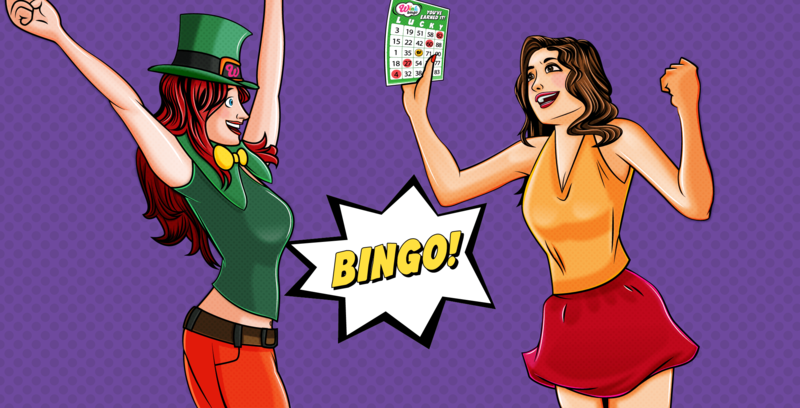 So, we’ve all heard traditional Bingo calls like “two fat ladies: 88!” There are tons of these - but this is my St. Patrick’s Day Bingo Party, so I’ve made up my own bingo calls especially! Feel free to use them or adapt them, and you can make up the rest yourselves! Colin Farrell’s got a nice bum: ONE! Sinead O’Connor, Nothing Compares to You: TWO! Mrs. Doyle says, “will you have a cup of tea?” THREE! How many of them are in The Corrs? FOUR! It’s Ryanair, will we make it alive? FIVE! Shane MacGowan’s performing pissed: SIX! Michael Flatley is Riverdancing like heaven: SEVEN! Conor McGregor is punching great: EIGHT! Pierce Brosnan’s Bond is so handsome, he’s mine: NINE! I’m on the Jameson’s whiskey again: TEN! Liam Neeson would track you from LA to Devon: ELEVEN! AP McCoy’s got trophies lined up on his shelves: TWELVE! Bono avoiding his taxes is mean: THIRTEEN! Enya sailed away like a queen: FOURTEEN! I’ve drunk my weight in Baileys Irish Cream: FIFTEEN! Pot of gold or magic beans? SIXTEEN! Daniel Day-Lewis fans are keen: SEVENTEEN! Graham Norton’s chat show has got to be seen: EIGHTEEN! All the best things in life are green: NINETEEN! Gift of the gab, the Irish have plenty: TWENTY! The Commitments had a good theatre run: TWENTY-ONE! The luck of the Irish is nothing new: TWENTY-TWO! Rory McIlroy’s ball’s hit a tree: TWENTY-THREE! Tayto crisps make you want more: TWENTY-FOUR! I wish Terry Wogan was still alive: TWENTY-FIVE!